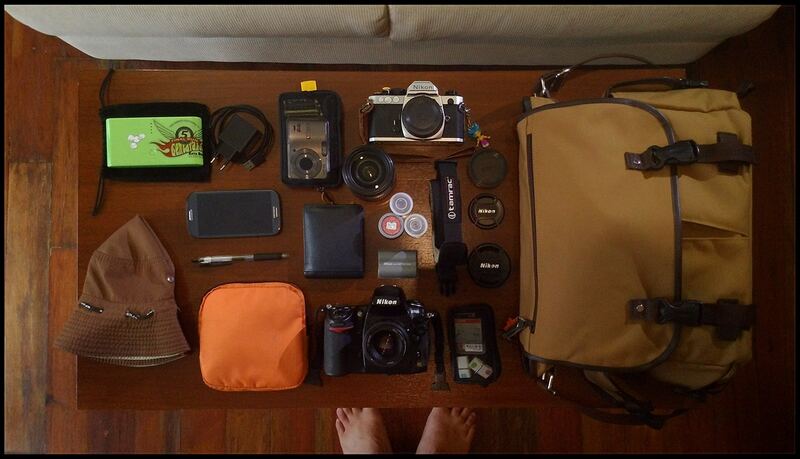 In part 2 of this, the most enormous of bag posts, Thorsten shares with us his day bags. Come and have a look, they are very cool. Thosten is back, for part 2 of his bag post. 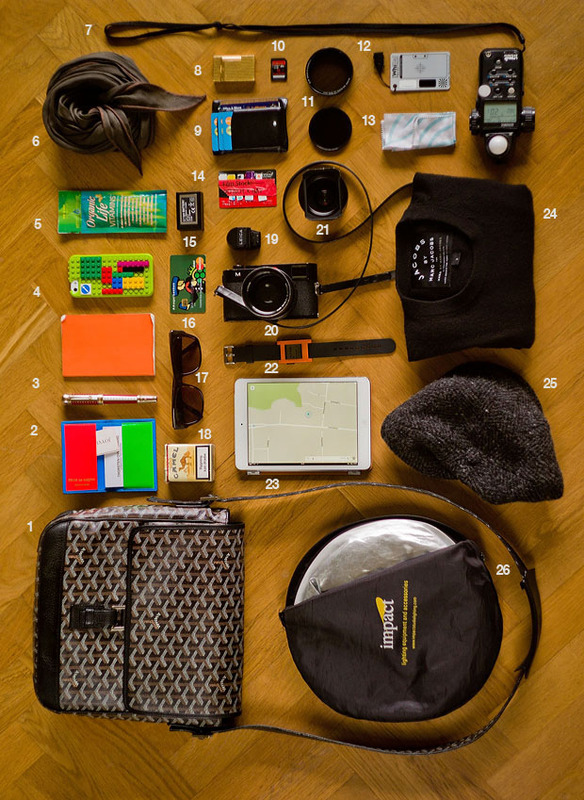 This one features his daily bags and what he walks around with when he is doing his workshops. When I have arrived at a place, the big iCare photo bag and the computer bag stays in the room. I have two different bags I pack for walking about. 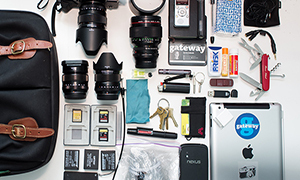 I always wear the camera across the chest, so the camera bag is actually for show and all the extra stuff. Long time ago when I spent most the time in Denmark, I would have a huge winter jacket that would have lots of pockets for this stuff. 1. My Louis Vuitton Binocular Bag is a very special bag they made for the runway show in 2012. I got it the day before my first exhibition and my birthday so it has a special meaning. It is calfskin leather, not very practical if it rains a lot (but that’s too late now!). Inside it is super well made with soft skin and pockets. But more importantly I found out that smaller bags are less tiring to carry all day than larger bags, even if they have the same in them. So that is why I have smaller bags for walking out and about all day. And this is one of them. 2. Hermés scarf. A gift from a model I photographed. 3. Marc Jacobs cashmere jumper. Super soft, warm and very compact for morning and late afternoon when it gets colder. I have loads of them as part of my standard uniform, $80 from Marc Jacobs in New York, a true bargain. I dress in layers because I walk a lot, go in and out of places and stay out so many hours I really never know how the weather will be. 5. iPhone 5 with LEGO cover. It’s actually Smallworks cover (I regret to say; I hate copy products, but) vintage LEGO bricks from the 70s on top. 6. Dr. Price’s Organic Life Vitamins daypack in liquid form. 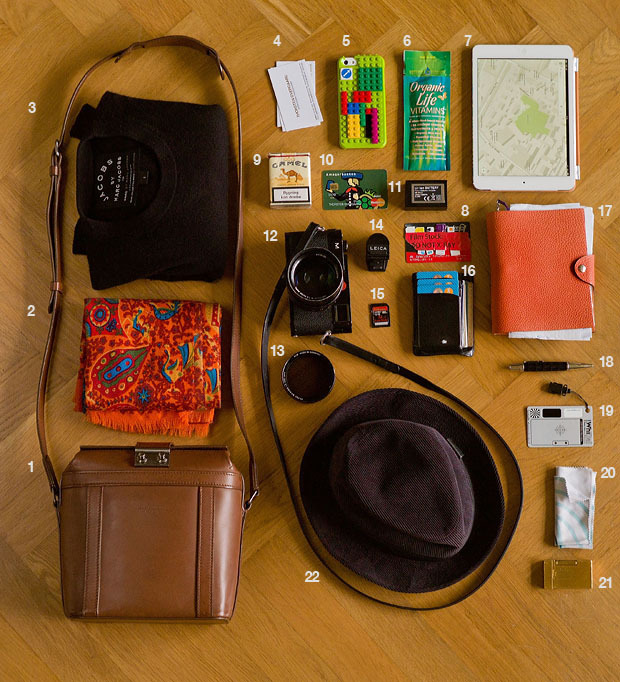 7. iPad Mini for checking mails and finding things when out and about. 8. I have 3G prepaid cards for the iPad Mini for quite a few countries but use iPad less and less. 9. Cigarettes without filter. Why would it be healthier to inhale through a plastic filter? 11. One extra battery for the M240. The one in the camera will usually last for 6-7 hours, so one extra is enough. 12. Leica M240 with Leica 50mm Noctilux-M ASPH f/0.95. For this type of bag I have only one lens with me, and the camera is over the shoulder, never in the bag. The strap I use currently is the black leather strap that comes with the Leica M Monochrom. 13. B+W variable ND-filter that goes from 0.5 stop to 6 stops. 14. EVF-2 for the Leica M240. 15. I have a backup SD-card in case the 64GB SanDisk card in the camera should have an error. I never need the space, just a backup card. 16. Mont Blanc wallet with cards and cash. I usually have my sim cards and greycard in that as well. 17. Hermés notebook Ulysse MM with plain un-lined paper. 18. Mont Blanc roller ball that belongs in this bag. Every bag has some things that are always in that bag. Else I forget them. 19. WhiBal greycard for white balancing. 20. Microfiber clothe for cleaning the lens and camera. 21. My Dupont lighter has followed me for many years. 22. 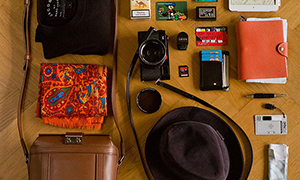 Hermés hat that can fold into the bag. It was a gift from a photographer I did one-on-one workshop with. 1. My Goyard shoulder bag of hand-painted canvas with calf skin corners is made very similar to Louis Vuitton bags, by a similar old company in Paris that has specialized in travel equipment. It is very traditional and has yellow cotton inside as all Goyard bags have had for the last 221 years. And a few pockets. They make special made to order bags also and I am considering getting one specially made for what I need, but this one is actually very close to ideal. It is small and light, and at the same time takes quite a few things. 2. COMME des GARÇONS wallet with my business cards as well as Joy Villas. 3. Mont Blanc Joseph II fountain pen and Moleskin notebook with lined paper. 4. iPhone 5 with LEGO cover. 5. Dr. Price’s Organic Life Vitamins daypack in liquid form. 6. Hermés silk/cashmere scarf I bought in Hamburg. 7. Sekonic L-758 DR lightmeter that I use when I do portraits. This along with the reflector and WhiBal card are the tools I use when I teach portraits in the workshops. 8. My Dupont lighter has followed me for many years. 9. Mont Blanc wallet with cards and cash. 10. I have a backup SD-card in case the 64GB SanDisk card in the camera should have an error. I never need the space, just a backup card. 11. B+W variable ND filter 0.5 – 6 stops for the Noctilux (62mm + a 60-62mm step-up ring). B+W Filter 3-stop ND filter size VIII for the 21mm Summilux. 12. WhiBal greycard for white balancing. 13. Microfiber clothe for cleaning the lens and camera. Always polish your camera! 14. I have 3G prepaid cards for the iPad Mini for quite a few countries. 15. One extra battery for the M240. The one in the camera will usually last for 6-7 hours, so one extra is enough. 16. Backup Mastercard in every bag in case I should lose my wallet. Standing in Shanghai without money and cards … would be a nightmare. 17. My Barton Perreira prescription sunglasses. I seldom wear them because sunglasses increase the contrast I see. It has to very strong sun before I pull them out. 19. EVF-2 for the Leica M240. 20. Leica M240 with Leica 50mm Noctilux-M ASPH f/0.95. The strap I use currently is the black leather strap that comes with the Leica M Monochrom. The length is good and the design simple. 21. Leica 21mm Summilux-M ASPH f/1.4. 22. Pebble watch that communicates with the iPhone so I get an alert if someone calls or sends a text or mail. I also get an alert every time I sell a book! 23. iPad Mini for checking mails and finding things when out and about. 24. Marc Jacobs cashmere jumper. Super soft, warm and very compact for morning and late afternoon when it gets colder. I have loads of them as part of my standard uniform, $80 from Marc Jacobs in New York, a true bargain. I dress in layers because I walk a lot, go in and out of places and stay out so many hours I really never know how the weather will be. 25. Stetson hat I bought in Berlin. 26. Reflector in 60cm diameter (2 feet). I mainly use the zebra side; the one with silver and gold mix. A huge thank you goes out to Thorsten, for putting together this massive body of work. 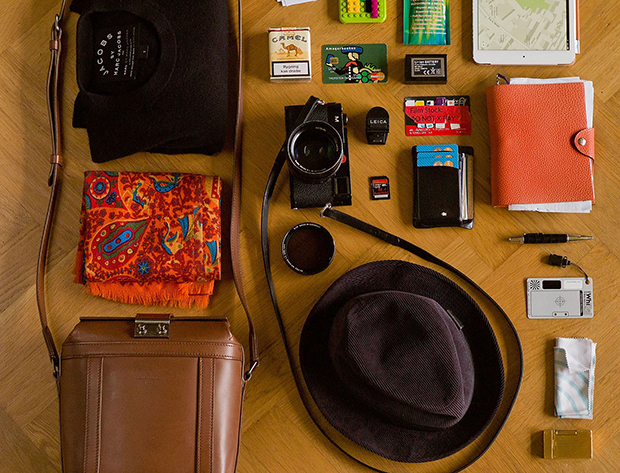 It is really cool to see inside the bag of a world traveller. Not exactly for a nights stroll in the Bronx area. Otherwise a nice outfit for nonstelth use. WOW, those accessories are so camp ! Leica as fashion accessory. Hermes has clearly hit their mark. In a way yes David. If Hermes made a Leica strap it would be a hit as most Leica photographers would definitely love a perfect made strap without much other than just well made handcraft showing. In many ways I think the corporation between Leica and Hermés in special editions is a great idea, though it may actually be more because Hermés used to own Leica (and still does in Japan where the limited Hermés editions are mostly thought out by the manager – who used to work at Hermés). Beautiful pictures on your website by the way, as always. Mediocre amateurs. Have found ways to take advantage of the incompetence of other mediocre amateurs. 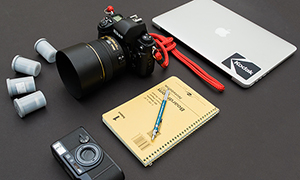 The focus on trendy gadgets is consistent with their approach to photography. And they are accredited by Leica! This is the sign of what is now photography. TvO has been very gracious with sharing his knowledge with others for free! go to his WWW site and check out the Digilux 2 pages for example? re: Steve , yes he gets a little excitable , but is that a bad thing now? Really, who would have thought Torsten would bring something only for show? Unreal. haha ^^ such a jerk!! !